This is the view from my dining room windows. It is not always visible because of all the low clouds and rain that we get, but when it is, it is spectacular! During winter the low sun creates the most beautiful lighting effects on everything. On this evening the frost was really thick on everything. It tends to build up because the sun doesn’t get high enough to melt it off things. So the hoarfrost almost seems to grow. This made everything seem so cool and gray and soft compared to the bright warm glow on the mountain peaks. I cannot seem to get a photo of this painting that really shows the coloring well, but this isn’t too bad. As with a few of my paintings now, I have painted this a couple times (or pretty close to this) and it gets a little better each time. 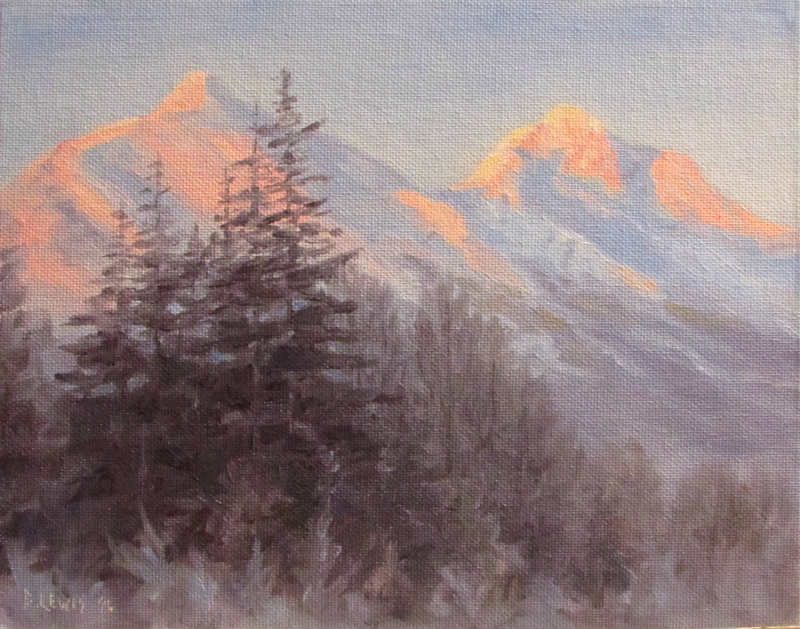 This entry was posted in alaska, landscape, light, mountains, oil painting, snow, sunset, trees, winter, woods and tagged Alaska, Juneau Alaska, landscape, low light, oil painting, strong light, warm light, winter, woods by Artwithmycoffee. Bookmark the permalink. I love this painting!!! The grays in the foreground support the glow in the mountains and make it even more impressive. I also like the narrow values of the distant mountains. Stunning!